According to a special six-month report from CoreLogic, the single-family rent index has had a 4.1% cumulative increase between January and June 2018. To put it in perspective, single-family rentals make up one-half of all residential rentals nationally but often become an overlooked part of the housing market. These rentals are also affected by market forces and fell rapidly during the Great Recession. Single-family rentals are bouncing back strongly from 2010 when they were at their low point which mirrors the house price growth. As with the housing market, low rental home inventory is feeling the price increase. During the Great Recession, the American household lost more than $16 trillion in net worth dropping national home prices drastically. Single-family rental home prices began recovering and kept recovering until their peak in August 2008 and then fell 5.7% to the lowest point in January 2010. 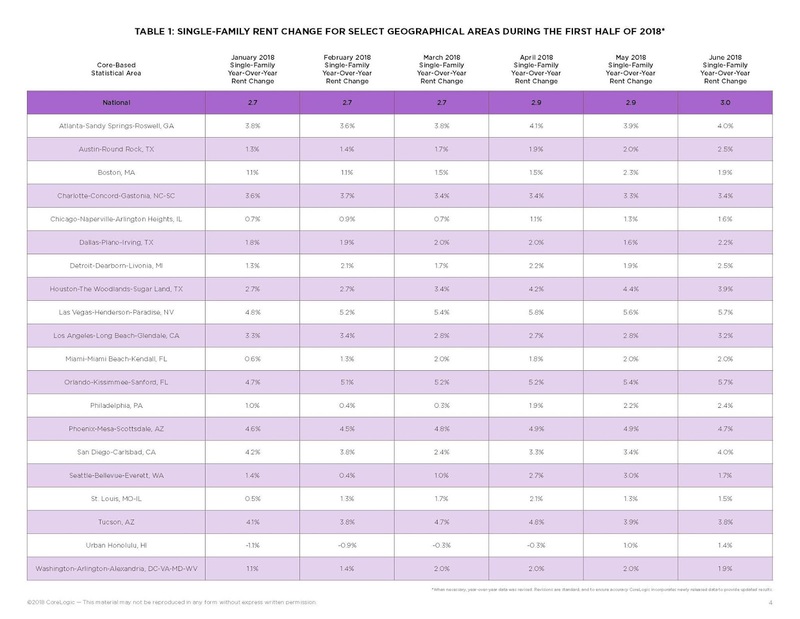 Nevada, Florida and Arizona have seen the most fluctuation between rental prices over the last decade. Las Vegas has been the leader with Orlando and Phoenix close second and third. 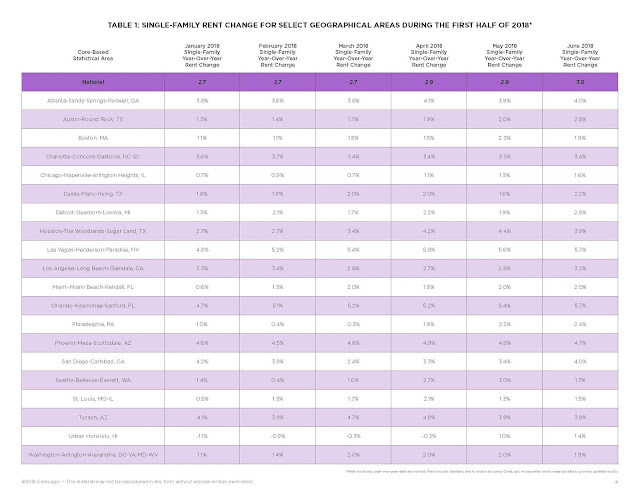 The chart below (provided by CoreLogic) shows the single-family rent change for select geographical areas for the first half of this year. High-end or luxury rentals saw a higher cumulative rent growth of 4.2% since January 2018 while low-end rentals saw a growth of 3.4% since January. Another factor is that the 2016 hurricane season blasted the rental market in many coastal metro areas. For a 17-month period that began in May 2016, Houston metro area experienced decreasing year-over-year rental prices. Rental prices have since rebounded because people have short memories in regard to major events and Houston metro area has peaked at 4.4% in May 2018. High demand and low supply of lower-priced single-family rental properties continue to push up rents for this segment of the rental market. With these market forces expected to stay in place in the near term, rents on lower-priced rental properties should continue to outpace those of higher-end rental properties. – Molly Boesel, Principal Economist at CoreLogic. What does this mean for you? Well with rents continuing to climb, suddenly the adherent cost of owning a home starts decreasing. The month-over-month cost of paying for a home suddenly begins to look more inviting. And you are not paying someone else’s mortgage for them! Contact me today about becoming a Homeowner! Need Another Reason to Buy Now?